Love forever, just as mother nature intended. 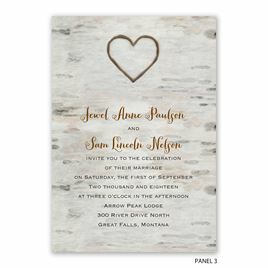 These birch tree love for infinity wedding invitations feature an artistic, watercolor background and a unique, trifold design. 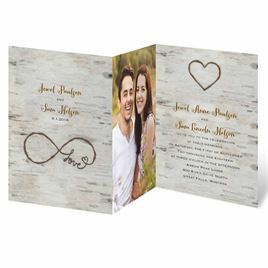 The infinity symbol is beautifully finished with the word "love" and your photo is featured on the center panel of the invitation. Daughter is getting married in May and she sent me a picture of the Wedding Invite she wanted. Yes, it is a bit pricey, but so worth it! She's worth it!!! She loved it so much that she had me order more invites! The Response Cards are just as beautiful. If you're looking for a photo invite with plenty of room for details, I would suggest getting this set. I loved my invitations! They were the right color, the right great quality feel, and I loved how beautifully the photo of us was smack dab in the middle. I used the paper that enhanced photos and it was worth it!